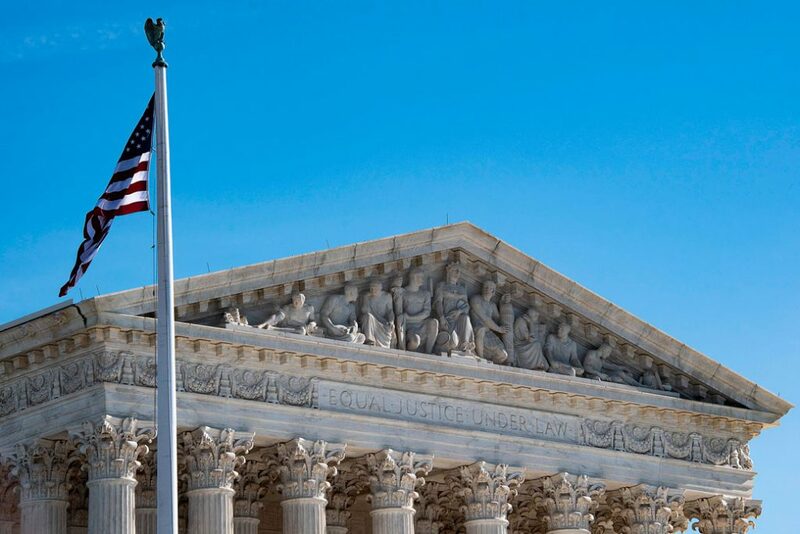 Yesterday, the U.S. Supreme Court declined, for now, to take up the Trump administration’s request to review the lawsuit challenging the administration’s decision to end Deferred Action for Childhood Arrivals (DACA). DACA, the initiative that has provided protection from deportation, as well as work authorization, to nearly 825,000 young undocumented immigrants over the past six years, has been in jeopardy since the Trump administration announced its end in September 2017. * While the Supreme Court’s decision is good news, DACA is not out of the woods yet. The administration has made it clear it wants to end the program entirely, and the Supreme Court could still grant review in the months ahead, considering the issue in the new term that begins in October and with a decision likely in 2020. Although those who never applied for DACA still cannot apply for protection today, the process to renew remains in place. In January 2018, the first of several court injunctions reopened the renewal process for Dreamers who have or once had DACA. One of these injunctions was affirmed by the 9th U.S. Circuit Court of Appeals in November, while the others continue to work their way through the federal courts. 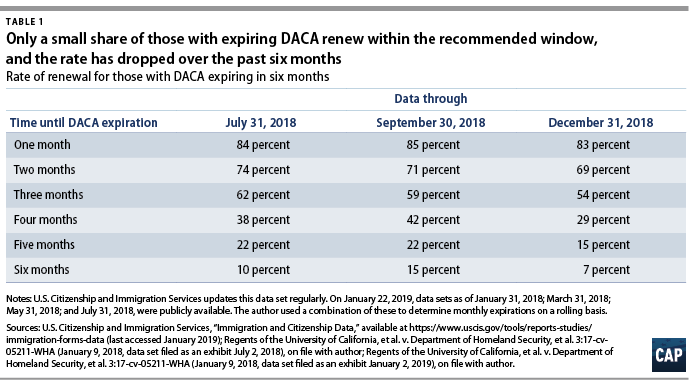 This column takes a look at current data on DACA recipients and their renewal applications, highlighting how many Dreamers have successfully renewed and forecasting near-term renewal rates. Recent data filed by the U.S. Department of Homeland Security provide some insight into the state of DACA renewals. In the year since courts first issued these injunctions reopening the renewal process, nearly 323,000 Dreamers applied to renew their DACA. More than 276,000 individuals have had their DACA renewed, nearly 2,000 applicants were denied renewal, and 45,000 renewal applications remain pending. Overall, the renewal application rate has been high: Each month, from 96 percent to nearly 100 percent of Dreamers with DACA expirations from March 2018 to December 2018 have applied. These high rates came on the heels of a renewal push from advocates in August 2018, when more than 48,000 DACA recipients submitted renewal applications. 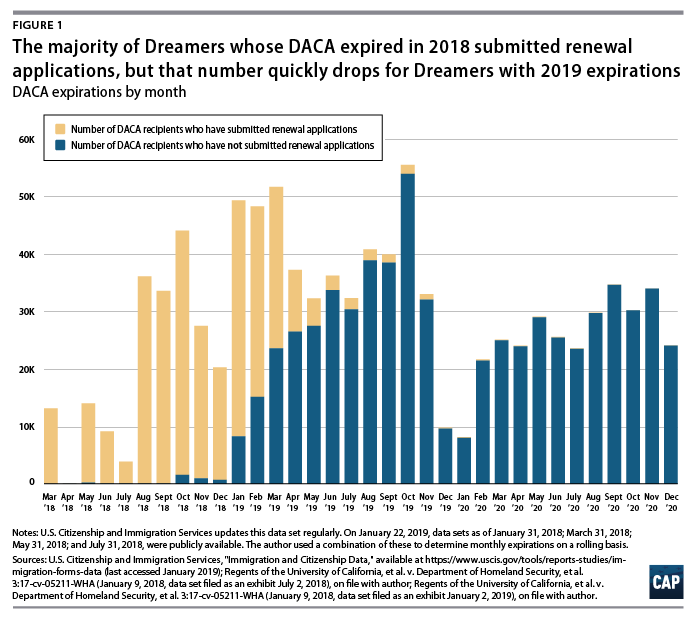 As a point of comparison, through the last quarter of 2018, approximately 31,000 DACA recipients, on average, applied for renewal each month. Likewise, the rate of adjudication—the process by which U.S. Citizenship and Immigration Services (USCIS) reviews, and then either approves or denies, applications—has continually ticked upward. According to CAP calculations, as of December 31, 2018, 86 percent of all renewal applications submitted had been adjudicated, leaving 14 percent pending. Most of these adjudicated applications, 99.4 percent, have been approved, while 0.6 percent have been denied. Yet, even considering these relatively high renewal rates, the number of Dreamers with active DACA has declined—from a post-injunction peak of 704,000 in July 2018 to 687,000 as of December 31, 2018. And nearly 5,000 individuals with pending renewals have already seen their DACA expire, leaving them at risk, since a pending application provides no protection. Original USCIS guidance recommended that Dreamers submit their renewal applications 120 days to 150 days before their DACA’s expiration to ensure that their protections did not lapse while the agency reviewed their case. Therefore, one would expect to see Dreamers whose DACA expires about four to five months from now currently submitting renewal applications. However, renewal rates for expirations on the horizon do not reflect this: As of December 31, 2018, only a small share of DACA recipients with expirations four to five months out had submitted their renewals. This is especially troubling given that large numbers of individuals with DACA expirations in January, February, and March 2019—47,000 Dreamers in total—have not yet submitted renewals. And further into 2019, even more Dreamers are at risk of losing their protections if DACA comes to an end: An additional 291,000 Dreamers’ DACA expires before the end of the year. Immigrant advocacy organizations are coordinating free and low-cost legal service provisions and setting up funds for those who need financial assistance. Those looking to support DACA recipients can contribute to crowdfunding efforts such as United We Dream’s DACA Renewal Fund or FWD.us’ Protect DACA Youth Fund partnership with GoFundMe. Six years of research and surveys illustrate the importance of DACA in recipients’ lives. From gaining access to driver’s licenses and in-state tuition to securing better-paying jobs and health insurance, DACA is a lifeline for many undocumented immigrants, as well as for their families and communities. Regardless of yesterday’s Supreme Court decision to decline to hear the case at this time, individuals with DACA can and should renew their protections. Just this past weekend, President Donald Trump offered to extend the status quo by proposing a three-year extension of temporary status for current DACA recipients and certain Temporary Protected Status holders. The offer, another attempt to win the $5.7 billion in border wall funding over which the president shut down the government, came as 800,000 federal workers—and hundreds of thousands of federal contractors—continue to go without pay. It was paired with radical changes to U.S. laws offering protection to asylum-seekers and children fleeing violence and persecution. Ultimately, the offer continues to treat the 687,000 DACA recipients, as well as their families, as political pawns to be traded for the administration’s broader anti-immigrant agenda. As has been the case since the Trump administration ended DACA, only Congress can offer a permanent and durable solution for Dreamers. It is long past time for Congress to protect them. * Unless otherwise noted, all data come from evidence filed in Regents of the University of California, et al. v. Department of Homeland Security, et al., 3:17-cv-05211-WHA (January 9, 2018). The case is pending in the U.S. District Court for the Northern District of California. The data were filed as an exhibit on January 2, 2019, and are on file with the author.